All-in-one Early Rise walker is a walker, rising aid and stability bar. Lightweight folding walker adds safety to your step and helps reduce strain while sitting and rising. Durable aluminum frame serves as a stability bar wherever an extra hand is needed, such as in the bathroom. Single-button H frame folds quickly for easy transport and storage. Height adjusts from 31 3/4" – 35 3/4". 19 1/2"W x 21 1/2"D.
Add $5 to shipping charge. I can use this product all over my house.What I really love it the lower handles so I can stand up with them. And it completely foldable so it store easy and out of the way. It makes going out to the store or to eat a breeze now I don't need someone to help me up when I sit down to rest. This product gave me back my Independence. I have spinal Stenosis and this has been life saving for me. I get spasms in my buttocks and leg and could not get on my feet without the extra handle to help me on my feet. I ordered the wheels to attach to it and it is just what I need. I never want to be without it. MOST AMAZING INVENTION SINCE THE TELEPHONE !!! It is just wonderful all the way around. Anybody with bad knees needs this !!! It is so lite yet built so strong ! You can't go wrong with this ! Also it is nice looking & modern. I can't say enough good about this walker. Love it. I feel so much more comfortable and independent with it. Thank you so much Easy Comfort for bringing such wonderful functional tools for the disabled !!! I really like the easy rise walker. After four back surgeries I couldn't stand very well. This walker has helped me stand with very little help from my husband. Thank you so much. I hope to stand alone in the near future. The biggest problem is all the people in the 5 star assisted living home where my Aunt lives all have the same kind of walker, the old one. I really like this new one because my Aunt has issues getting off the sofa because the old walker handles are too high. But as you get older changing is hard and she still needs some practice and encouragement to use it. She is getting physical therapy at the Home and they are working with it. We're still out on whether it will be good. This is an excellent design for helping people to get up from chair that doesn't have an armrest. It is also great if somebody had a full this may help them to have some support in trying to get up. These are some of the reason that I bought this item. 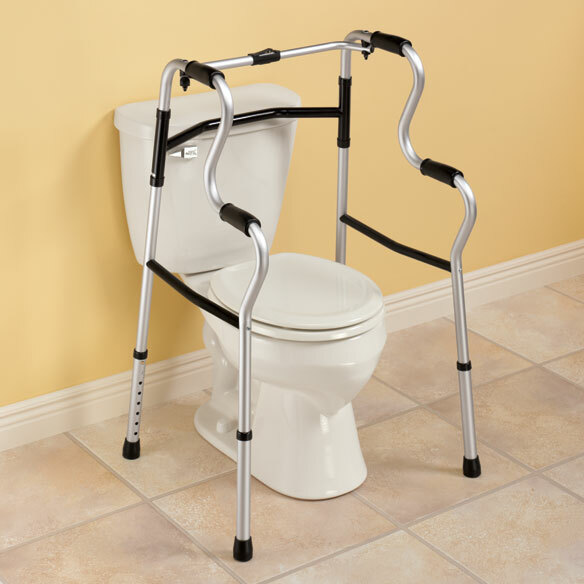 I bought this walker for my elderly mother for use with the toilet. It was pictured as both a walker and for toilet bars in the catalog. I would not recommend it for use around the toilet as it is too narrow and the back hand grippers are too close to your shoulder when sitting down. It is also rather flimsy. it might be ok if just used for getting up from dining room or living room chairs, but not for use in the bathroom. Need it to get up from sitting or off toilet. 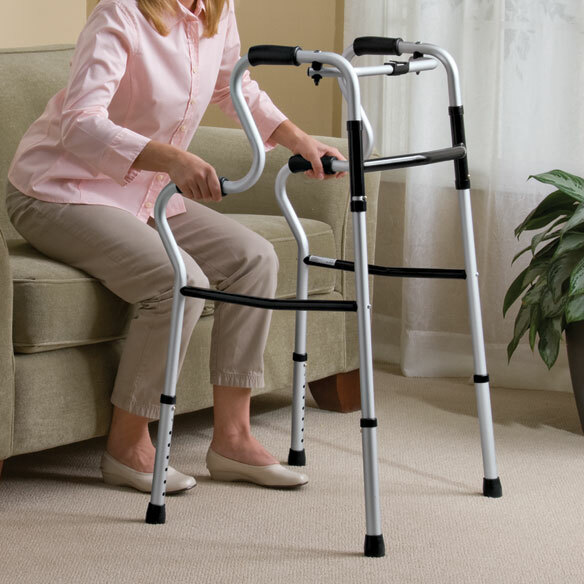 This is the third purchase of this Walker. Excellent product A-Z! HELP IN RISING WHILE EXERCISING LEG MUSCLES. Plan to use when traveling both in the bathroom and when standing from chair or couch. It perfect to travel with. especially in hotel washrooms!! eureka ! I only have one leg and have problem getting off the toilet. I thought I might try this due to the lower hand rails. It will help my sister very much with her Parkinson, she needs more assistance getting up. Mobility issues. Difficulty standing up. Hopefully it will assist in my standing after back four major back surgeries within one year. I really need it to work. As a aid for rising from a chair. My wife can use this to get around better. I need extra help right now trying to get up from my chair. hip and knee operations up coming and I have low toilets. My mother has a hard time getting up from a seated position with her current walker. The lower handles might help. At suggestion of physical therapist. It looks like it would be helpful to Parkinson's patients for rising from a chair. Haven't tried one yet so hope it's as advertised. I need help sitting and rising from a chair. My husband has a difficult time getting up from our sofa. Hopefully this will help him instead of me pulling him up. I have trouble standing and sitting. hoping it will help me get up out or recliner after my knee removal surgery and until new knee is put in ... about 7 weeks. I need help getting up from armless chairs. husband has parkinsons and this will allow us to travel is we wish. Post hip surgery; provides support and stability both standing or seated. Help Mother-in-Law get up from couch more easily. It's gotten harder to get up from the bed. Appears to be very sturdy. I have some trouble getting in and out of chairs and wanted some extra security when standing up. Especially after sitting for a while. Can standard walker wheels be used on this walker? BEST ANSWER: I would not suggest adding wheels. It may present a problem when patient is rising, walking would be OKI I haven't tried it. We had to return the item, it didn't fit with my patient. can i get one with wheels on one side ? BEST ANSWER: Thank you for your question. We do not carry an Easy Rise Walker with wheels. We apologize for any inconvenience. How do you fold this walker? BEST ANSWER: Press down on the left side of the black piece on the fop crossbar and at the same time fold the left leg toward the middle. The right side will fold easily on top of the first. What is the arm handle height? BEST ANSWER: Thank you for your question. The lowest is 22”, highest is 26” We hope this information will be of help to you. What is the height from the lower hand rails to the floor using the shortest height adjustment?